The Canada stamps issued during the period from 1903 to 1908 featured a new set of definitive stamps with the portrait of King Edward VII and a set of commemorative stamps honoring Canada's French colonial past. The seven new definitive postage stamps for King Edward VII, shown above, were issued between 1903 and 1908. 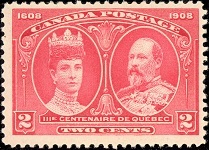 These designs are very similar to the 1898 definitive Canada stamps of Queen Victoria, except that the maple leafs in the upper corners have been replaced by crowns. The portrait of the new king is based on the coronation painting, featuring the king in military uniform and wearing the ermine collared coronation robe. 1 C. (1903 - Scott #89) - Green. 2 C. (1903 - Scott #90) - Carmine. 5 C. (1903 - Scott #91) - Blue on Bluish. 7 C. (1903 - Scott #92) - Olive Bister. 10 C. (1903 - Scott #93) - Brown Lilac. 20 C. (1904 - Scott #94) - Olive Green. 50 C. (1908 - Scott #95) - Purple. 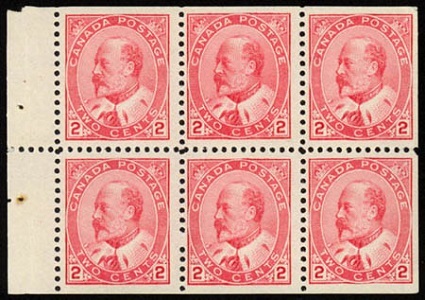 The 2 C. denomination King Edward VII Canada stamps were also issued in booklets. Booklet panes of these Canada stamps are very scarce. 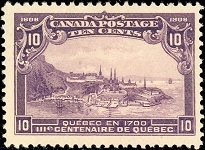 The eight commemorative Canada stamps shown directly below were issued on July 16, 1908 to celebrate the 300th Anniversary of the Founding of Quebec City. Quebec City (French: Ville de Quebec) gets its name from the St. Lawrence River promontory where it is located. In the Algonquin Indian language, the word "Kebec" means "where the river narrows". Jacques Cartier built a fort on the site in 1535, where he stayed for about a year. Cartier returned in 1541 to establish a permanent settlement there, but it was abandoned in 1542, due to hostile natives and the severity of the Winter weather. Samuel de Champlain established the first permanent settlement on the site on July 3, 1608, and it became known as Quebec City. Sixty years later, it had a population of 550, and by the early 18th Century, the population had grown to about 8,000. 1/2 C. (Scott #96) - Prince and Princess of Wales in 1908. 1 C. (Scott #97) - Jacques Cartier and Samuel de Champlain. Jacques Cartier (1491-1557) was a French explorer and the first European to map the Gulf of St. Lawrence and the St. Lawrence River (1534-1542). He claimed the territory along the St. Lawrence River for France, calling it "Canada", after the Iroquois Indian word "kanata", meaning "village" or "settlement", and he referred to the native inhabitants as "Canadiens". Cartier was also one of the first explorers to formally acknowledge that the New World was a separate land mass from Europe and Asia. Samuel de Champlain (1574-1635), known as the Father of New France, was a French navigator, cartographer, draughtsman, soldier, explorer, geographer, ethnologist, diplomat, and chronicler. He founded New France and established the permanent settlement of Quebec City on July 3, 1608. In 1620, King Louis XIII appointed him to be the administrator of the new colony, and he remained in that role until his death in 1635. 2 C. (Scott #98) - King Edward VII and Queen Alexandra. 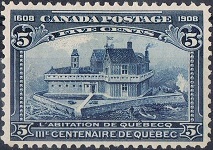 5 C. (Scott #99) - Champlain's home in Quebec City. Present day Fort St. Louis was originally a wooden fortress overlooking the St. Lawrence River that Samuel de Champlain built in 1620 for the defense of Quebec City. It has been reconstructed many times over the centuries. Champlain's residence was actually in the right corner of the fortress, as viewed above, and he lived there until his death. The structure was also the residence of later French and British colonial governors. 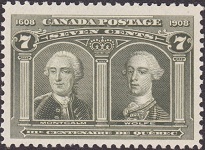 7 C. (Scott #100) - Generals Montcalm and Wolfe. Louis-Joseph de Montcalm-Gozon, Marquis de Saint-Veran (1712-1759) is best known for being the commander of the French forces in North America during the Seven Years War (1756-1763), also known as the French and Indian War (1754-1763). Montcalm had initial successes against the British forces in North America during the Seven Years War, but his army was defeated, and he was killed, during the Battle of the Plains of Abraham (Battle of Quebec) on September 14, 1759. Major General James Wolfe (1727-1759) is remembered for his victory over the French at the Battle of the Plains of Abraham (Battle of Quebec). Though his army was successful in capturing Quebec City, he was killed, at the height of the battle, on September 13, 1759. He became known as the "Conqueror of Canada", since his army's capture of Quebec City and eventually Montreal ended French control of the country. 10 C. (Scott #101) - View of Quebec City in 1700. 15 C. (Scott #102) - Champlain's departure for the West. Champlain left Quebec in 1604 to explore further West on the St. Lawrence River. 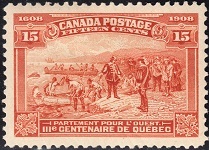 That event is depicted on the 15 C. denomination stamp shown above. 20 C. (Scott #103) - Arrival of Cartier at Quebec in 1535. 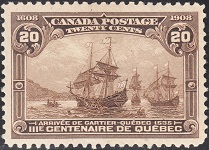 Jacques Cartier's second voyage arrived at Quebec on September 14, 1535. The three ships were called the Grande Hermine, the Petite Hermine, and the Emerillon.